"Occasionally a bronze chariot rumbled along the flags, and there was a brief glimpse of a tall, hawk-faced noble, with a silk cloak wrapped about him, and a gold band with a rearing serpent-head emblem confining his black mane; of the ebon, naked charioteer bracing his knotty legs against the straining of the fierce Stygian horses." -- Robert E. Howard: "The Hour of the Dragon"
Known as the "Serpent of the South", Stygia is a decadent theocracy and is characterized by being xenophobic, inscrutable, and obsessed with the subjects of death and immortality. 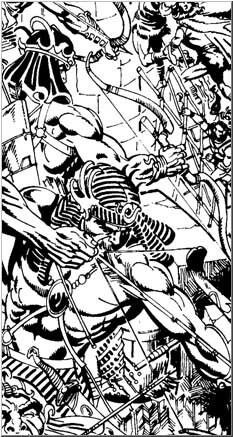 To the Hyborian races, Stygia represents a sinister, sorcerous menace, a black land of nameless horror whose cult of the fanged serpent god, Set, is looked upon with cold dread. Stygia came into being when the ancestors of modern Stygians drove westward and conquered the land from the snake men who built the black pyramids and the haunted tombs beneath the pyramids. Contemporary Stygians are a mysterious people whose society is strictly organized in a class system dependant, by and large, upon physical types. The royalty and the most ancient nobles are relatively tall people with black hair and fair skin. Below these, the ruling elite of aristocrats and a powerful middle class are dusky-skinned, hawk-nosed men, haughty of mien. The lowest classes are peasants and slaves of hybrid stock, a mixture of Kushite, Shemite, Hyborian, and Stygian ancestry. Stygian society is dominated by the priesthood. The chief god of the Stygians is Set, the Serpent God, whose influence has stretched from the lands of Stygia into nearly all other lands. Rarely will a Stygian venture from his own lands. Even more rarely will an outsider enter his, as it is death for one who is not a Stygian to enter a Stygian city. Any wanderers found inside Stygian territory are killed. This may be done unceremoniously, or it may involve a sacrificial ritual. The Stygians have never been known to allow captured trespassers to live. The only exception to this rule is the harbor-city of Khemi, where foreign merchants are allowed entry during the day, but must return to their ships at night. The population is notably small, for, despite its size, there is little arable land, and that is mostly along the banks of the River Styx (also called Nilus). The Stygians have developed an economy based on nomadic herding, fishing, and harvesting the palm date; major industries include the production of sorcerous charms and amulets, as well as drugs and pharmeceuticals for both medicinal and magical use. Silk and steel arms are also manufactured here and are sought after for trade by the merchants who travel the numerous caravan routes across the nation. The Stygians are less effective with iron than the cultures of the west and far east, but they are great masters of bronze and ivory. Their treasures are ancient, and tell of a time when Stygia was far grander than the dusty ruins found today reveal. Their land is one of forgotten mystery, but it is known that their armies are well organized. In generations past their tall and muscular warrior castes have swooped across the desert in their bronze and brass chariots and inflicted grievous damage upon the Shemite ranks that stood against them. The ruler of Stygia is always the one most favored by their god Set. Legends of the Stygians tell that before the times of men, the serpent-men ruled Stygia. They are seen as ancestors of the Stygians, and are treated as holy demi-gods. To the outsider, the beliefs of the Stygians seem strange. The dead are mummified in long, involved rituals, which call upon the spirits of the underworld to perform many of the required tasks. The tombs of the Stygians are not like the tombs of other grand empires. They lack the masses of wealth which other races place within their graves. The dead of Stygia rest guarded by spells, and are buried with the scrolls and potions needed to return from the dead whenever their spirit is disturbed.